Be aware of the high cost of anger in a divorce (both financial and emotional). 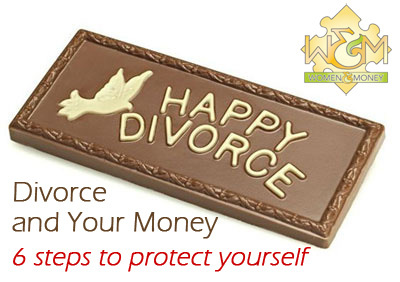 At Women and Money we have helped our Clients to deal with it all when it comes to money and divorce. We have seen tears of anger, rage, sadness and grief as couples separate and divorce. This is a very frightening time for many women. However, with the right professional help this can be a time of rebirth, hope and relief, as women learn they can get through this and they will recover. If you and your spouse are headed towards dissolving your relationship, think about divorce and your money carefully. Here’s a checklist of some of the important financial decisions you’ll need to make, and steps to protect yourself. Our experience tells us it is better to make them sooner rather than later. 1. Take financial inventory: Get out your pencil sit down and create a list of what you own (your assets) and what you owe (your liabilities): list the house, bank accounts, pensions, RRSPs, cars, mortgages, loans, lines of credit, credit cards, life insurance policies and group benefit plans. Next, write down who these debts and assets belong to, are they yours alone or are they joint? 2. Determine your costs: In pencil create a “budget” what are the costs of running the family home, the overall financial situation of the family and what you think it will take to create two separate households. Include extra costs such as healthcare needs and childcare and kids’ activities. Will you or the kids want or need to seek Counselling? 3. Tax consequences: Tax Lawyers or Accountants – Don’t skimp here – Get expert advice to help sort through the financial and tax implications of splitting assets and making (or receiving) any equalization payments. Remember that spousal support is deductible – child support is not. Also, child support amounts are mandated while spousal support is not. Don’t forget to consider government benefits such as child tax benefit and GST tax credits. 4. Update all of your documents: When you separate, review your choices for beneficiaries of registered investments, insurance policies, pension plans, and update your will. If you don’t have a will – make one! Also, you may want to revisit your Power of Attorney documents. You do not have to wait until the formal divorce decree arrives to make any changes to these documents. Do it now! 5. Be aware of the high cost of anger: In many divorces that end up with high legal fees, these fees are usually related to the level of hurt and anger between the separating couple. We recommend Counseling and Therapy as a more productive use of your money rather than spending it on a court battle. Anger, resentment and the desire for revenge are extremely expensive and highly destructive to everyone including the children. 6. Take time for yourself: Be gentle with yourself this can be a very scary time in a woman’s life – it is okay to be afraid – however, do not become paralyzed by the fear. Take charge and feel better sooner! This entry was posted in Blog, Divorce. Bookmark the permalink. Both comments and trackbacks are currently closed.